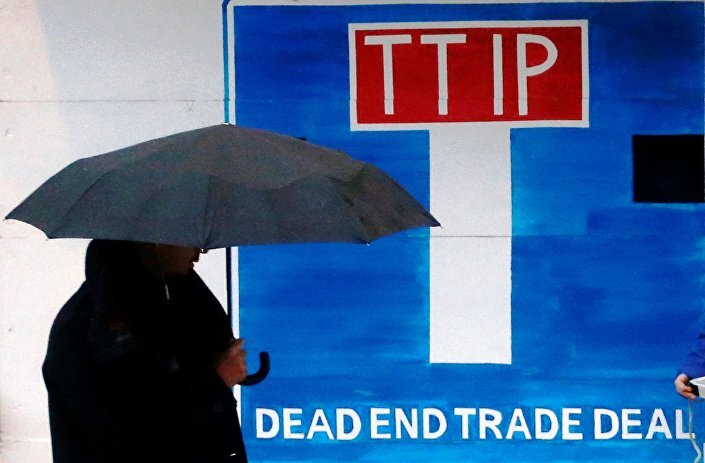 Union leaders on both sides of the Atlantic condemned the Trans-Atlantic Trade and Investment Partnership (TTIP), a secretive commercial agreement that is currently being negotiated between US and EU. Meeting in Washington, Richard Trumka, President of the American Federation of Labor and Congress of Industrial Organizations (AFL-CIO) and Luca Visentini, General Secretary of the European Trade Union Confederation (ETUC), stated jointly that, judging from the few available information about the deal's content, TTIP is going to sacrifice public interest in favor of big corporative interests. "We have consistently made clear that the agreement must not include a private justice system for foreign investors and any supranational obstacles to regulation in the public interest. We have called for broad, precise and enforceable protections for labour rights, public services, and the environment," they said. While acknowledging that some recent European-backed tweaks to the way transatlantic investments will be regulated and judged are a step forward from early negotiations, they still showed how the deal would be harmful for workers, and the general commonwealth. The major investment deregulations envisioned by the treaty were condemned strongly by Trumka and Visentin. "Investors should act responsibly and respect international guidelines such as those set down by the OECD and the UN. The AFL-CIO and the ETUC will further strengthen our cooperation to hold multinational companies accountable," they said. They also stressed that "labor rights, based on international conventions of the International Labour Organization, are indivisible and should be enforced at all levels in all our countries and entail economic consequences in case of breaches. "On these, as with other issues, we do not see our negotiators moving towards the 21st century agreement that we have been promised, but rather more of the same old corporate-style trade deal. The transparency we have called for has not been achieved. Not only have no draft consolidated texts been released, the U.S. has failed to publish even its own proposals," they added. This novel transoceanic alliance is a telltale sign of how TTIP is creating widespread discontent among workers in all the countries involved. Privatization of public services, excessive market deregulation and possible damage to environmental and consumer rights are some of the main points of contention among TTIP critics. But most of all, the fact that the text of the deal has not been made public yet is fostering suspicion on what it could eventually imply.